^ Rockwell (29 July 2011). "I Gave Sabbath Their First Gig". Vice. Retrieved 25 March 2019. ^ "The 500 Greatest Albums of All Time: (131) Black Sabbath – Paranoid". Rolling Stone. 31 May 2012. Retrieved 9 February 2013. ^ Nathan Davies (19 June 2010). "Myponga part of rock history". Adelaidenow.com.au. Retrieved 16 April 2016. ^ "500 Greatest Albums of All Time: (300) Black Sabbath – Master of Reality". Rolling Stone. 31 May 2012. Retrieved 9 February 2013. ^ "This Day In Hard Rock: Black Sabbath Releases 'Heaven And Hell'". Hard Rock Daddy. 25 April 2017. Retrieved 22 January 2019. 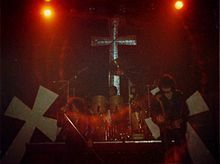 ^ "Vinny Appice Interview". Music Legends. 7 March 2012. Retrieved 6 May 2013. ^ a b Wiederhorn, Jon (13 January 2007). 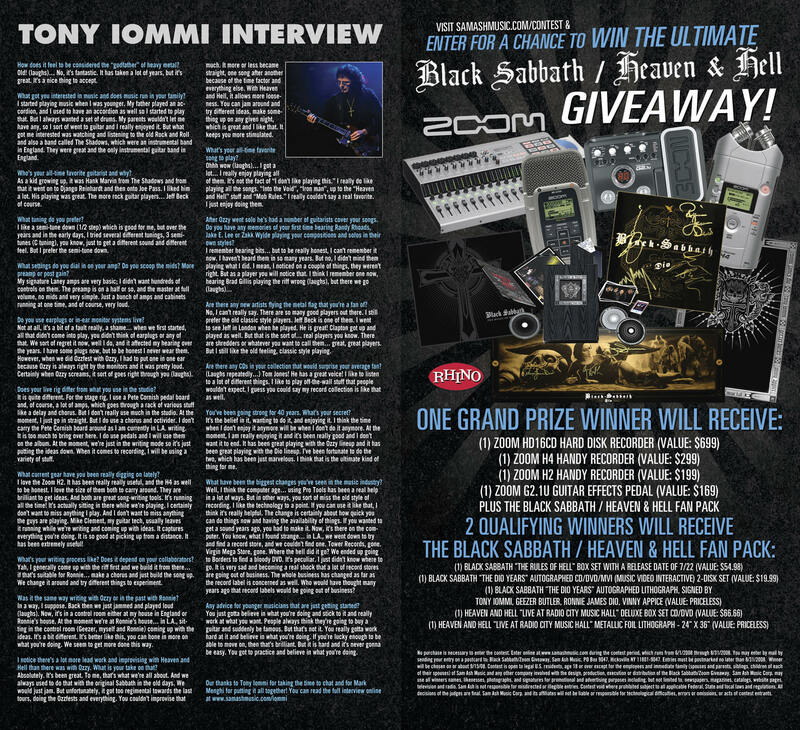 "Interview with Ronnie James Dio and Tony Iommi". Blabbermouth.net. Retrieved 17 March 2008. ^ "HEAVEN AND HELL Drummer: RONNIE JAMES DIO Is 'Singing Better Than He Has Ever Sung'". Blabbermouth.net. 5 March 2007. Retrieved 8 April 2008. ^ a b "BLACK SABBATH Guitarist Says It's A 'Shame' The Band Didn't Complete New Studio Album". Blabbermouth.net. 23 July 2004. Retrieved 8 April 2008. 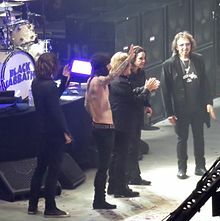 ^ "METALLICA: Video Footage Of BLACK SABBATH Rock Hall Induction, Performance Posted Online". Blabbermouth.net. 23 March 2006. Retrieved 8 April 2008. ^ "JUDAS PRIEST Frontman On 'Metal Masters' Tour: 'We Insisted On A Classic Metal Package'". Blabbermouth.net. 21 April 2008. Retrieved 25 April 2008. ^ "Black Sabbath's Geezer Butler talks lyrical inspiration, 'Rock Band', 'Iron Man' Movies". Blabbermouth.net. 29 June 2010. Retrieved 9 October 2015. ^ a b Navarro, Dave (3 December 2010). 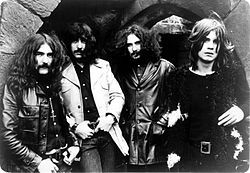 "100 Greatest Artists of All Time: 85) Black Sabbath". Rolling Stone. Retrieved 8 February 2013. 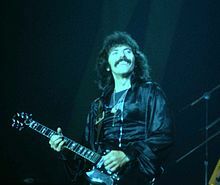 ^ "BLACK SABBATH's 'Iron Man' Tops VH1 List As the Greatest Metal Song of All Time". Blabbermouth.net. 3 May 2006. Retrieved 25 April 2008. ^ "IRON MAIDEN Bassist Talks About His Technique And Influences". Blabbermouth.net. 24 September 2004. Retrieved 25 April 2008. ^ "DISTURBED Guitarist: Don't Call Us 'Nu Metal'". Blabbermouth.net. 3 June 2009. Retrieved 8 March 2010. ^ "OPETH Pays Tribute To Classic Heavy Metal Artists". Blabbermouth.net. 10 September 2007. Retrieved 25 April 2008. 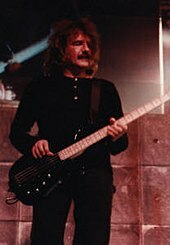 ^ "BLACK SABBATH Bassist: 'It's Great When Bands Cite Us As Their Influence". Blabbermouth.net. 25 July 2007. Retrieved 25 April 2008. ^ "HEAVEN AND HELL, MEGADETH Perform in Los Angeles; Photos Available". Blabbermouth.net. 29 April 2007. Retrieved 25 April 2008. ^ "Ex-FEAR FACTORY Axeman DINO CAZARES Talks Guitars". Blabbermouth.net. 22 May 2007. Retrieved 25 April 2008. ^ "GODSMACK'S Next Album Will Rock in a Bluesier Way". Blabbermouth.net. 2 November 2004. Retrieved 25 April 2008. 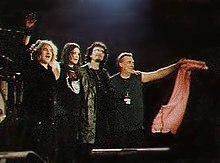 ^ "METALLICA Induct BLACK SABBATH into ROCK AND ROLL HALL OF FAME: Photos Available". Blabbermouth.net. 14 March 2006. Retrieved 25 April 2008. ^ a b c "Metal/Hard Rock Musicians Pay Tribute To BLACK SABBATH's 'Paranoid'". Blabbermouth.net. 18 September 2005. Retrieved 25 April 2008. ^ Morgan, Anthony (14 January 2008). "LAMB OF GOD To Switch Record Labels For Non-U.S. Territories". Blabbermouth.net. Retrieved 25 April 2008.